Not the most thumbed book in the library, it's true. 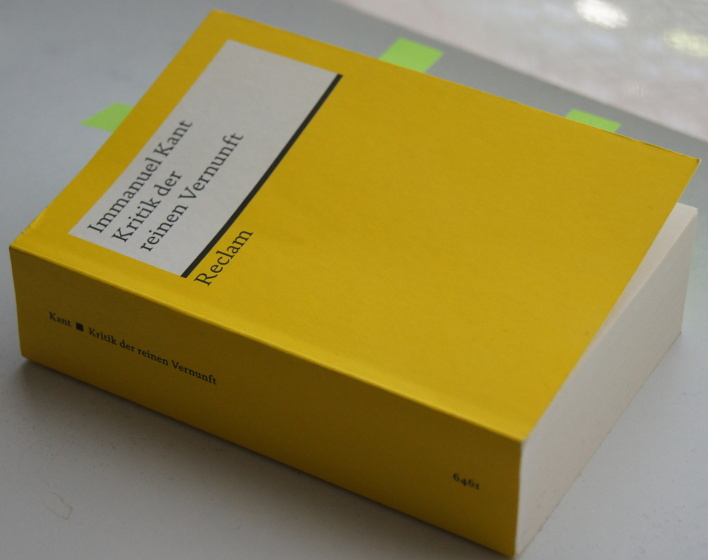 Immanuel Kant's (1724-1804) monumental Kritik der reinen Vernunft, 'Critique of Pure Reason'. The dedication to the second edition is signed and dated 23 April 1787, 230 years ago today. The edition you see here is from the estimable German publisher Reclam. It is 1011 pages long, weighs 396 g (not far short of a pound), and occupies a volume of 492 cm3– nearly half a litre. It measures 148 x 95 x 35 mm – it might just be considered to be a carrying book but it will permanently wreck any pocket into which it is stuffed. 'Is that Kant's Kritik der reinen Vernunft in your pocket or are you just very, very pleased to see me?'. It cost me €14.60, which means that at around 3.68 EUR per 100 g it's nearly twice the price of respectable Swiss cheese, the measure of value on this blog. However, like Dr Who's Tardis, it is much bigger on the inside than on the outside. It has put food on the table of compositors down the centuries. We note in passing that this profession has often been the breeding ground of revolutionary movements, the compositor being generally a well-educated person who has read more widely than any philosophy student. When you consider the human labour that has gone into typesetting the successive editions of Vernunft you have to wonder at its real worth. As for the content, anyone with a little training in linguistic analysis will realise on the second page of I.i.§1 that Kant is on completely the wrong track, like someone in a rubber dinghy in the sea off Land's End in Cornwall, who, intending to return for a nice cream-tea at that café on the seafront sets off paddling west instead of east. Six months later this person will have to make do with a bagel. Our paddler had already taken 80 pages to get to his starting point so he or she is clearly up for the long haul. Heroic – but why? One of Kant's less endearing characteristics, apart from his love of mindless routine, is his confidence in his own conclusions: 'It follows that...' occurs with irritating frequency throughout the book, whilst the struggling reader is shouting: 'no it doesn't'. Such tantrums can get you thrown off buses, trains and flights (particularly with certain American airline companies – although the book makes an excellent martial arts weapon). Bertrand Russell thought Kant overrated but decided as a professional philosopher that he could not simply ignore him. The choice is yours. Our age is actually the age of criticism, to which everything else must be subjugated. Religion through its holiness and Laws through Your Majesty commonly want to avoid such subjugation. But then they awake a justified suspicion of themselves and cannot claim the universal recognition of those who accept only those things that can survive free and public examination. Reclam edition: Vorrede zur ersten Auflage 1781, p. 866. Translation ©FoS.Online text. Unser Zeitalter ist das eigentliche Zeitalter der Kritik, der sich alles unterwerfen muß. Religion durch ihre Heiligkeit und Gesetzgebung durch ihre Majestät wollen sich gemeiniglich derselben entziehen. Aber alsdann erregen sie gerechten Verdacht wider sich und können auf unverstellte Achtung nicht Anspruch machen, die die Vernunft nur demjenigen bewilligt, was ihre freie und öffentliche Prüfung hat aushalten können. So 230 years to the day after Immanuel signed off his dedication to Kritik der reinen Vernunft on that Monday, 23 April 1787, let's raise a glass, nibble some cheese and thank him for all the blessings his book has bestowed on mankind.